When it comes to drinking water, getting a passing grade from the government does not mean water is safe. Federal drinking water standards are often woefully inadequate to protect public health because the regulatory process does not consider the heightened vulnerability of children, infants and developing fetuses to toxic chemicals. In addition, there are no enforceable federal health standards for many chemicals known to pose risks, leaving the public susceptible to harm from new and emerging contaminants in tap water. Drinking water standards and other environmental regulations are too often based on political and economic compromises aimed at keeping treatment costs down. But what would these standards look like if the public interest came first? EWG scientists reviewed the best and latest scientific evidence, legal standards and health advisories, and defined water quality goals that will truly protect public health. With the third edition of our National Tap Water Database, we're introducing EWG Standards for chemicals and other pollutants that have no regulatory limit or that have legal limits too weak to assure good water quality. Going forward, we will determine and publish health-protective standards not only for drinking water contaminants, but also for hazardous chemicals in food and consumer products, in farming and in the workplace. Our approach puts Americans’ health – and especially children’s health – ahead of corporate interests, lobbyists and the slow wheels of regulatory standard-setting. We believe that this approach is not only right for our health, but good for our communities and the economy. The Safe Drinking Water Act, first passed in 1974 and last reauthorized in 1996, was good for its time and improved water quality to a basic level. But progress has stalled, and in the past 20 years the federal government has failed to establish any new standards for previously unregulated drinking water contaminants, a pattern of inaction that has exposed hundreds of millions of Americans to a large and growing number of pollutants at potentially harmful levels. Especially troubling is the fact that the Environmental Protection Agency has not effectively implemented the intent of the Safe Drinking Water Act, which states that drinking water regulations should consider the effects of contaminants “on groups within the general population such as infants, children, pregnant women, the elderly, individuals with a history of serious illness, or other subpopulations that are identified as likely to be at greater risk of adverse health effects due to exposure to contaminants in drinking water than the general population.”  New research shows that amounts of contaminants previously classified by the government as acceptable for drinking water, such as the legally allowed amounts of disinfection byproducts or the fertilizer chemical nitrate, can increase the risk of cancer and may harm the developing fetus. 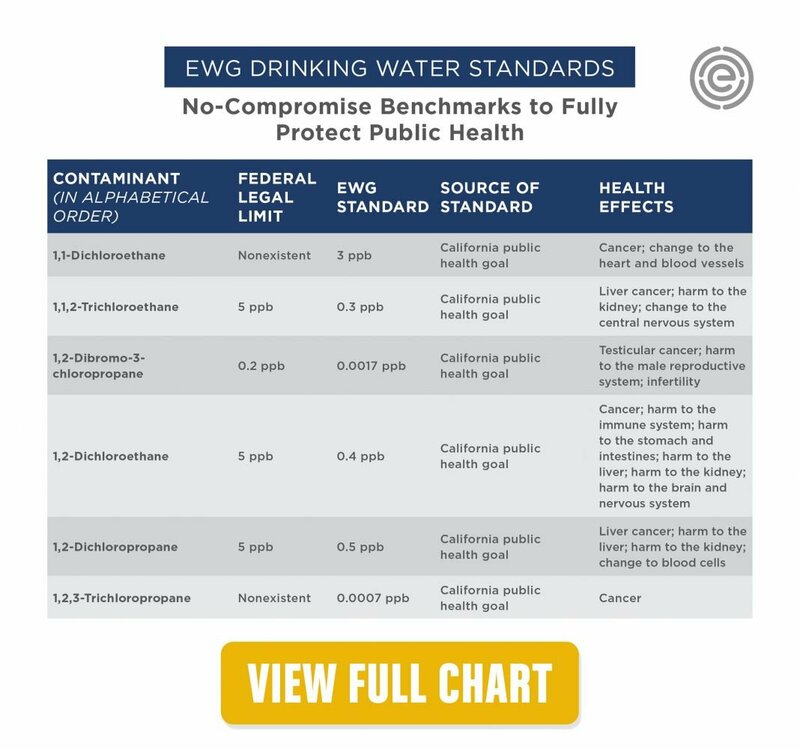 EWG scientists reviewed the scientific evidence, federal and state legal limits for drinking water contaminants, health advisories and risk assessments, and incorporated them all into the guidelines in our Tap Water Database. Most of the guidelines in the database are based on public health goals established by scientists in the California Office of Environmental Health Hazard Assessment. Unlike the EPA, California continually reviews and updates its public health goals and water quality standards. A California public health goal is “the level of a chemical contaminant in drinking water that does not pose a significant risk to health” when consumed for a lifetime. We also incorporated cancer risk levels for drinking water contaminants published by the EPA Integrated Risk Information System. Although California’s public health goals and the EPA's cancer risk levels are much more protective than national drinking water regulations, there are still areas where improvements are needed because traditional risk assessments don’t go far enough to account for human variability. Chemical risk assessment is a continuing process because rarely is there complete information about the toxicity of environmental contaminants. Further, new research shows that exposure to contaminants during pregnancy and critical periods of development can cause subtle damages that increase the risk of diseases in adulthood, including cancer, brain and nervous system damage, and infertility. These types of changes are seldom captured in risk assessment decisions that are based on findings from laboratory animal studies. Finally, people can have greater susceptibility to toxic contaminants based on age – children are more vulnerable than adults – and individual genetic makeup. For many contaminants there are no published health guidelines, let alone enforceable standards. Based on the latest research, EWG researchers defined a health guideline for nitrate, a fertilizer chemical linked to a greater risk of cancer and birth defects, and for perfluorinated chemicals, contaminants linked to immune system damage in children and harm to the mammary gland development at very low doses. Science-based health guidelines incorporated into the Tap Water Database set goal posts that will help Americans make choices to protect themselves when government standards fall short. The database will also serve as a resource for private sector leaders and public officials in state and local governments who want to put people’s health first. Responsibility for ensuring your tap water is safe and clean ultimately lies with federal, state and local government agencies, as well as public water systems. But all too often this chain of quality control fails. Stymied by politics and industry pressure, the EPA has not established new water quality standards in two decades. Federal regulators and Congress have also failed to mandate strong measures for the protection of sources of drinking water such as rivers, streams, lakes and groundwater. Without such actions, tap water quality will remain at risk. Some states, such as California and New Jersey, have the resources and expertise to set their own health guidelines and enforceable limits for pollutants. But most states lack the capacity to assess contaminant safety – and point to the federal government for cover when problems are discovered. Every day, local water utilities face the challenge of filtering and treating tap water to remove agricultural, industrial and urban pollutants that are discharged into drinking water sources. The utilities have very little control over the contaminants flowing into the watershed, forcing them to undertake expensive treatment to meet standards, which are often inadequate anyway. Most only focus on contaminants regulated by the federal Safe Drinking Water Act. When the public demands better water quality, the issue of treatment cost invariably comes up. The financial challenges faced by water utilities are real because as a nation we have not sufficiently invested in drinking water infrastructure. This problem will only get worse if government officials and water utilities ignore the reports of pollutants in the water supply, disregard the latest research on health harms from tap water pollutants, and fail to monitor source water quality. The development of EWG Standards is an ongoing project. Our standards will be updated based on new research and the evolving understanding of variations in human susceptibility to toxic effects of environmental contaminants. These standards will also help members of the general public choose the best water quality options for themselves and their families, from looking for home filtration systems that remove certain contaminants to advocating for strong water protection at the local, state and national levels. Change will only come if Americans demand it.